​This weeks video will change the way you think about kindness. Kindness is more than the example of the Good Samaritan. Are you ready? Name five experiences where God showed you kindness in your life. Make time in the next week to read the book of Ruth. How is kindness demonstrated in this book? Are you kind to yourself? List three things that you can do this week to help grow in this area? How is kindness demonstrated in your home? Focus on being kind in your home this week. Place a sign by your bed that reads "Be Kind" so it is your first thought each morning. I made you a lovely background for you cell phone, you can click here for the backgrounds. Kindness is showing goodness, generosity and sympathy towards others. It is an act that cost us time and energy. Last week we learned what Kindness is and this week we are learning how to actively put it into practice. 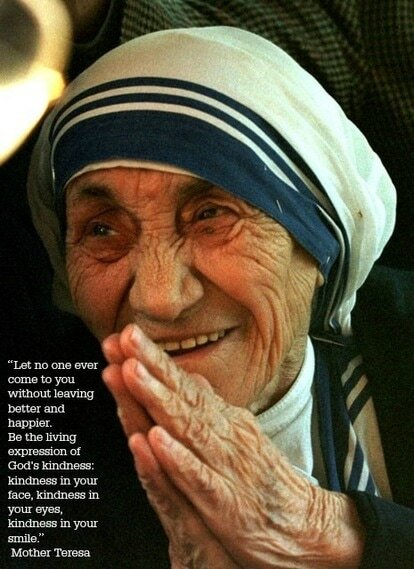 I love the quote above by Mother Teresa when it says kindness in your eyes. In the book Blink by Malcolm Gladwell and I love how it talks about the science behind our smiles. A German team of psychologists learned that our emotions do not control our facial movements, but if we smile it can change our moods. Also, that if you are asked to smile you will do so using the muscles around your lips, if you smile spontaneously you will smile with the muscles around your lips and eyes. I love that! My desire is to smile with God's kindness pouring out of my smile, face and eyes all the time! The German psychologists learned that our emotions do not control our facial movements, but if we choose to smile it can change our emotions. Here's an example: you are having a disagreement with your children, the the phone rings - you see on the call display that it is a good friend, what do you do? You put a smile on your face and the tone in your voice changes as you answer with a friendly "Hello!" This is a choice that we make, it may cost us time and energy but we are the hands and feet of Jesus that people need to experience. A good friend of mine passed away this morning from cancer. It hurts. I know her hurting is over but mine will last a while. She was an example of kindness, generosity and sympathy. Here's an example: A couple of years ago my Dad was rushed to emergency and because I live 3,000km away I was at a loss. I wrote on my Facebook status how hard it was to live so far away and be helpless. My friend without hesitation offers to pay for my flight home. Thankfully I didn't need to accept her offer, but her generosity astounded me. This is only one example of her goodness toward my family. One more from the many examples: During our home renovation my husband used a chemical in our home that was so toxic that we had to leave immediately. It was winter and -40C and all of our windows were frozen shut so we knew that we would be homeless for a few days because of the smell. We packed a few things to get out of the house fast to head to a hotel, when I remembered my friends offer to stay at her house if we ever needed it. It was already evening and I gave her a call from my cell phone as we were sitting in our driveway and without hesitation she told us to stay with her and to make sure I brought my yarn so we could crochet by the fire. Not only did we have a warm bed to sleep in, but she wanted to make our stay welcoming and comfortable. Her generous spirit has impacted our family in a way that we will never forget and we hope to share her legacy of kindness with others in the future. Your homework this week is to actively show and be kindness around you. I have created a Pinterest Board for the Fruit of the Spirit online Workshop, you can click on the button below to check it out. ​The board is full of ideas for Random Acts of Kindness. I have been on the receiving and giving end of a RAOK and it is an awesome feeling. This week I want to challenge you to show kindness in way that costs you time and energy. Journal about it, so that you remember how it felt. I know I have done simple things like paying for the order of the car behind me in line in a drive-thru or putting quarters in parking meters and it is an adrenaline rush. I wish I could see the look on their face. Yesterday I went to the local thrift store to drop off the items that didn't sell from our garage sale and when I opened the back of the van (which was packed to the roof) a man parked near by came over to our rescue and offered his help and carried all the heavy stuff. I was so thankful. No matter what you are able to do big or small, it makes a difference. I would love to hear about your experiences doing Random Acts of Kindness, please share them on the forum page or maybe you want to blog about - make sure you share the link so that I read about it. It is so heart-warming to hear great stories. There is still good in the world and it is in us to share. Happy Random Acts of Kindness Week! I would like to welcome Amy Bayliss to the Fruit of the Spirit online workshop! You are going to love her, her accent, her heart and her message. Cajun: born and raised just south of Baton Rouge, LA. I'm passionate about family, heritage, home, and my Lord, Jesus Christ. Here is where I share ideas, thoughts and creativity inspired by life and my walk with Him. I'm married to my best friend, Ryan, and we have four boys ranging in age from toddler to teen. It takes some pretty creative engineering to keep our home and family prospering but we figure it out and I'm happy to share some of our life with you all! Right now I feel like Oprah or Ellen - Amy has written a book and you are all getting a FREE COPY! Amy is generously giving us all a copy of her book for free! 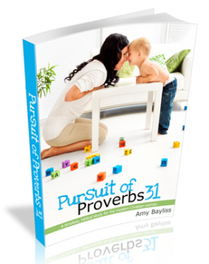 CLICK HERE for Amy's FREE book offer!!! Two years ago just before Lent was to begin a friend of mine posted on Facebook her thoughts on Lent. It really started something within me as well. I had never disciplined myself to do anything for lent. I saw tons of "friends" shutting down their Facebook for Lent, or giving up coffee or chocolate. As I kept seeing these posts running through my Facebook feed I kept thinking that these are things that people are overdoing anyway and just a choice they should make not something designed for strengthen your spiritual discipline. I felt like I needed to do something but I wanted my "something" to benefit others, to be a positive more than a negative. Over the years in various workshops that I teach I have had participants do an exercise. The exercise is to write an encouragement or thank you note to some one who has been a mentor or an example to you in your life to let them know the impact that they have had on your life. We don't always take the time to do that, so it is a good exercise. Sometimes in the workshop people can't stop writing and want to write several. It was this thought that led me to idea for lent. For 40 days I hand wrote an encouragement or thank you note and mailed them to people in my life. What I thought was a great idea to encourage and lift others up took on a life lesson for me that taught me so much. The first couple of weeks were easy and then I started to run out names and addresses. But what I wasn't prepared for was how the notes would affect those who received them and the emails and letters I received in return. It became an encouragement to all, I hope that it spread beyond myself and those 40 notes. That the 40 people sent notes of their own to those who have made an impact on them. A couple of time during this study of Kindness we have heard that it is something that costs us time and energy. It is something that we need to go out of our way to do. Something that we have to put thought to. This weeks journaling activity is to actively show Kindness through the postal service. It is always exciting to receive mail, it's even more exciting if it is a special note. I wish I could see the faces on those that will be on the receiving end of the notes that are on their way! Grab your journal and spend time writing what you have learned and how you have experienced and shared kindness over the past three week, at what costs? My challenge to you is to hand write at least 5 encouragement or thank you notes and mail them out before the next lesson.